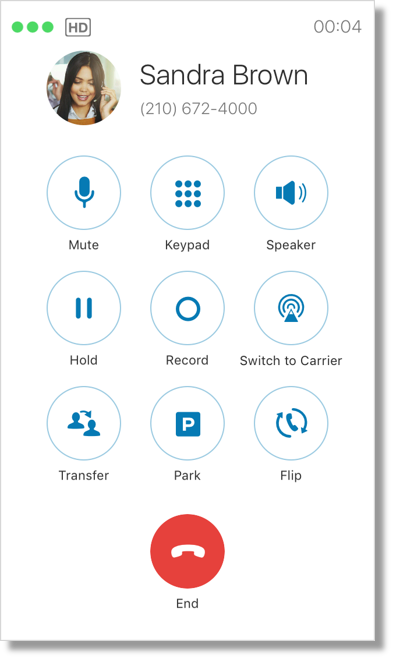 Active Call Controls are soft keys accessible to conveniently use various features on your Office@Hand Mobile App such as Hold, Mute, Keypad, Audio Source, Flip, Transfer, Record, and Park. These features can be modified by logging in to your online account and configure the settings as desired. Hold Puts the other party on the line on hold. Tap the blue Hold button to go back to the call. Keypad Allows you to use the keypad whenever you need to press numeric inputs to access a certain department or queue. Record This will allow you to manually record your call. The Record icon is Blue while the call is recording. Speaker Allows you to toggle between using your headset and loudspeaker of your device. The Speaker icon is Blue when Loud Speaker is enabled. Switch to Carrier This will transfer a VoIP Call to your smart phone’s mobile carrier so you can continue being in the same call. This will help you get a better call quality in places where data or WiFi connection is unstable. Allows you to flip your call from one device to another, as long as you have configured your Call Flip settings properly. You can set up your Call Flip settings through the AT&T Office@Hand Online account or through the Mobile App. See Managing Call Flip Settings on your AT&T Office@Hand Mobile App to learn more. Transfer Transfers your active call to a different extension. Park This will Park the call. A parked call can be retrieved by an extension within the phone system. Deactivates your microphone which may allow better incoming sound data from the other party.This button can be used to minimize the noise from your side of the call. Tap the Unmute button to reactivate your microphone.